One of my professors in college used to say this about freedom. You have the right to swing your fist in as much as it does not hit your neighbors nose. At that point it turns from you swinging your fist around to hitting your neighbor. We go from looking at ourselves and our stuff, to harming our neighbor. In that situation, we aren’t using our freedom for the right thing. We are free, not to do what we want. But we are free to do what is right. Paul says that those us that strong, we should look out for those that are weak. Why? Shouldn’t they take care of themselves? Shouldn’t I just do what I want to do because I can? No. We don’t live for ourselves. We live for God. We live for His glory and for His purpose. We are here for Him. And for each other. And to use what we have, who we are, our freedom, to love God and love our neighbor. Today, you have freedom. You do. You can do what you want to. There is no one to make you do anything. You have freedom. 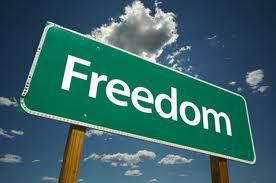 But remember, that freedom is not given to you to do what you want to do. Its given to you to do the right thing. Today, use that freedom for God. And for good. Take care of each other. For God’s glory.